On Tuesday 15 July 2014, the Met Office implemented ‘ENDGame’ physics into the dynamical core of its global atmospheric forecast model. This was the culmination of many years of research and development and two years of implementation and testing. At the same time, the resolution of the Met Office Global Model (GM) was increased from 25 KM to 17 KM and the resolution of the assimilation scheme from 60 KM to 40 KM. Peter Buchanan (right) is a meteorologist at the Met Office and has over 40 years experience of working in weather forecasting and recently applying science developments in an operational environment. What does mean for the Scottish Flood Forecasting Service? Improved atmospheric model performance inevitably leads to improved flood forecasting performance in all the areas of concern, namely surface water, rivers and coastal. The GM also provides boundary conditions for ‘nested’ high resolution ‘shower permitting’ models like the Met Office UKV model (1.5KM horizontal resolution). Better accuracy and resolution at the boundaries can lead to better performance of the downstream high resolution models. Once again, good news for the flood forecaster! Better consistency and accuracy in the atmospheric models will also improve the performance of downstream hydrological and coastal models leading to an overall improvement in the performance of the flood forecasting service. The good news story does not end there. On 3 February 2015, the Met Office implemented ‘ENDGame’ physics into the high resolution models including the UKV. The use of high resolution numerical weather prediction in daily flood forecasting risk assessment. So, is this really the ‘ENDGame’? Of course not! As we get better, expectations also increase and increased expectation and confidence in our products lead to better and more focused responses to flood events. Potential changes in the climate may also lead to more frequent and more severe events. The flood forecasting community therefore needs to match these challenges through a process of continuous and user focused development. So what now? The Met Office recently announced a significant new investment in supercomputer capacity. The Cray®XC40™ will become operational in September 2015 and reach full capacity in 2017. This will keep us at the forefront of environmental science high-performance computing and help to deliver significant socio economic benefits through enhanced resilience to severe weather and related hazards. How will the new supercomputer benefit the flood forecasters? Various options are being considered which include improved resolution, more frequent running of high resolution models and better exploitation of forecast ensembles. 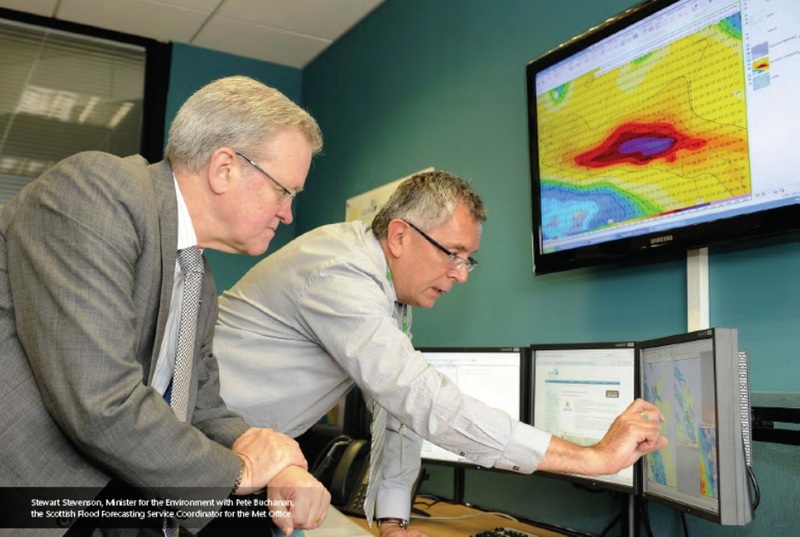 Parallel science and technical developments, in both the meteorology and the hydrology, will provide a platform that helps keep the flood forecasting service at the leading edge of the crucial services it provides. Looking further ahead, ENDGame will eventually be replaced by a new dynamical core and work towards this has already commenced. Like the weather, the associated R&D never sits still! This entry was posted in Forecasting, Research, Weather prediction. Bookmark the permalink.